Stella Two – You Little Beauty! I think I’m becoming a light junkie. I have a number of lights that I work under, depending on stitching circumstances. 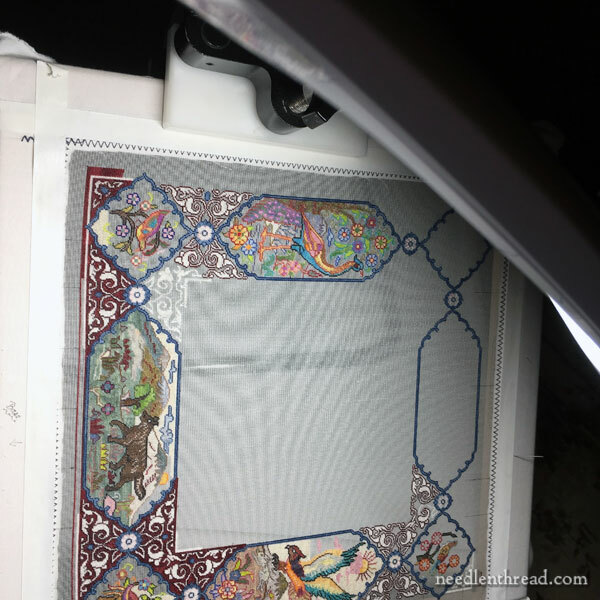 I’m firmly convinced that – aside from your needle, thread, and fabric – lighting is the most important consideration when it comes to doing detailed needlework. What it boils down to is this: you just can’t stitch in the dark! And the better your lighting, the more accurate and successful your stitching. So, yep, I’m a light junkie! I have several lights to stitch by. Some are floor lamps out in my workroom. They hang over my table. Some are little book lights that come in handy in a pinch, especially when stuck in the car, commuting, traveling. I have a couple average task lamps I can use when other people are stitching with me, so that they have task lighting if they need it. I have my magnifier and light combo for extra-fine, tiny stitching. I have one pretty lousy battery operated task lamp that I can take with me if I need to. And I have a sunny front porch that works great this time of year! But now…. now I have a Stella Two, thanks oodles to the folks at Stella Lighting! They didn’t ask me to, but I’m going to review this particular light for you, because I think it’s worth knowing about if you’re in the market for a task lamp. I reviewed the first Stella back in 2013 when it came out. Stella Lighting provided the lamp for me to try, and then to run a give-away for the same lamp. When I agreed to do it, my only thought was that it would provide a good opportunity for someone out there to get a free task lamp. I will admit, after using the lamp, I was a little bummed to give it away. I liked it a lot! But since I already had good lighting, I couldn’t exactly justify springing for one. I thought I would just forget about the Stella. But as it turns out, a few months later, my sister got one. She uses it at her sewing machine all the time, and she loves it. And so the green-eyed monster never really died. Still, c’est la vie. I went on with life. 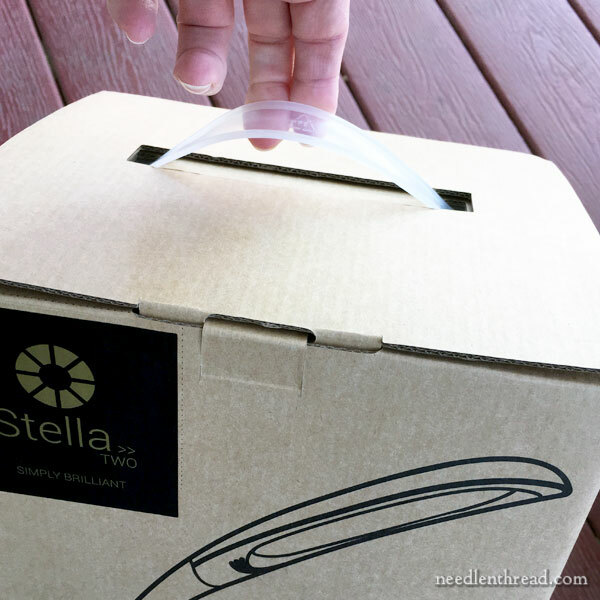 So when I got an email from the folks at Stella Lighting, asking if I wanted to try the Stella Two, no strings attached, you can imagine that I didn’t exactly say no. In fact, I think I may have shouted a resounding Yes that they could hear all the way over in Oregon. Oh, c’mon! Can you blame me? 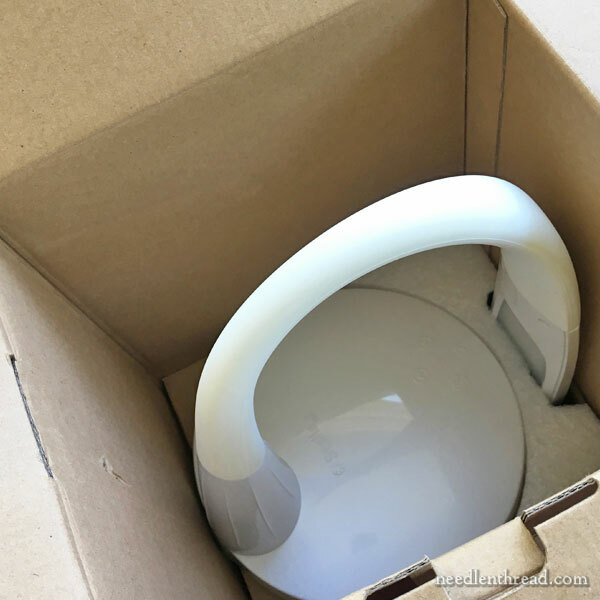 Right off the bat, one of my favorite non-light-related features of the Stella – and the Stella Two – is that it is a lightweight lamp that’s packaged in this compact, sturdy box with a handle. The box serves as a travel container for it, and the lamp travels exceedingly well. If you are a needleworker who travels and stays in hotel rooms, goes to seminars, and the like, this portability is extremely handy. The only accessary that I would add to the light if you are a hotel room stitcher is an extension cord. The wall cord that comes with the light is perfect for me at home – it’s about 6 feet long – but in a hotel situation, you might need a little more length for the plug. The neck on the two Stellas is very flexible, allowing the light to fold up into the box quite neatly and very simply. This flexibility of the neck is nice – it allows you to position the light where you want it, it holds its position well, and you can even twist the head of the light and rotate it to direct the lighting sideways and not just up and down. The lighting provided by the Stella is what they call “tri-spectrum” – that is, you have the choice between cool spectrum lighting, warm spectrum lighting, or a combination of the two. I prefer the combination of the two when stitching, or just the cool spectrum alone. The warm spectrum is quite yellow. I find it nice for reading, but not really for detailed stitching. The lights are high performance LED bulbs with a 50,000+ hour life. They don’t give off heat – or if they do, it’s minimal. I can’t feel it. Even after hours of use, the light is cool to the touch. For those of us who live in a warm climate, this is a nice feature. My studio lights heat up, and they can be uncomfortable to stitch under on hot days. I like the fact that this lamp is cool, light and portable – I can move it easily from room to room and give the studio lighting a miss when the weather’s toasty. Compared to the first Stella, the Stella Two is about 25% brighter. Lining it up next to my sister’s original Stella, there’s a notable difference! There are ten levels of dimmability on the Stella Two. The head of the lamp is long and slender. It lights a good-sized task area without a problem. The touch controls on the base of the light are on the base, with a bumpy tactile feel to them. They are literally touch controls. With barely a touch, the light does whatever you’re telling it to do. The first Stella has touch controls as well, but they are not tactile. These tactile ones are great in low-light situations. They’re easy to find, and it requires just barely a touch to turn the light off or on, dim it, or to change the spectrum settings. It’s hard to demonstrate how well the light actually works in a photo. Well, in a photo taken by me, anyway! This is my 56-count silk gauze piece, and the Stella Two is lighting it up in a dimly lit room. The room looks completely dark, but it’s not. I’ve got the Stella turned up to its brightest setting, with the combination warm / cool spectrum on. And I can see perfectly when I stitch with it. 1. The Stella Two provides excellent light, in a good-sized task area. 2. It’s cool (as in, temperature-wise). In fact, it’s cool the other way, too! 3. It’s light and portable. 4. The neck is extremely flexible and the head is fairly flexible to twist, so you can get the light right where you want it. 5. It’s dimmable and it offers a choice of light spectrums to work under. 6. It has easy-to-feel, tactile touch controls. 7. It has a two-year 100% customer satisfaction guarantee. 1. It’s not inexpensive for a task lamp. It clocks in at $219. But if the LED bulbs last as long as they say they will, chances are, you won’t have to buy another lamp for something like 20 years, even if you stitch 6 hours a day. 2. The touch controls are very sensitive, and while this is normally a positive thing, in some situations, it can be a negative thing. For example, when I reached for scissors across the base of the light the other day, my arm barely rubbed across the control area and turned it off. So that’s something to consider. In most cases, this isn’t problematic for me, but if this is the type of thing that annoys you, you’ll want to be aware of it. I love it! It’s definitely the nonpareil of sleek, slender, portable LED task lighting. Or, quite simply, it’s tops! Ask at your local needlework store, if you have one. They may carry Stella lights. You can check online through some needlework shops, like Needle in a Haystack. I don’t know if they carry the Stella Two, but they have the Stella Sky (their floor stand version) and the original Stella. You can see them here. You can also find them directly at Stella Lighting, here. February 12, 2018 Good Lighting for Needlework – Your Eyes Deserve It! The Stella 2 lamp looks a really good light and easily transportable from place to place, I can see why it would suit those who just need good lighting and I would consider it if it also had a magnifier. I need a magnifier as well as a light as my eyes aren’t as good as they used to be, I have the Dublin magnifier/lamp combo which is really great for indoors embroidery and a small travelling magnifier/lamp although I use this for out of doors embroidery it’s not that good but serviceable for my needs. 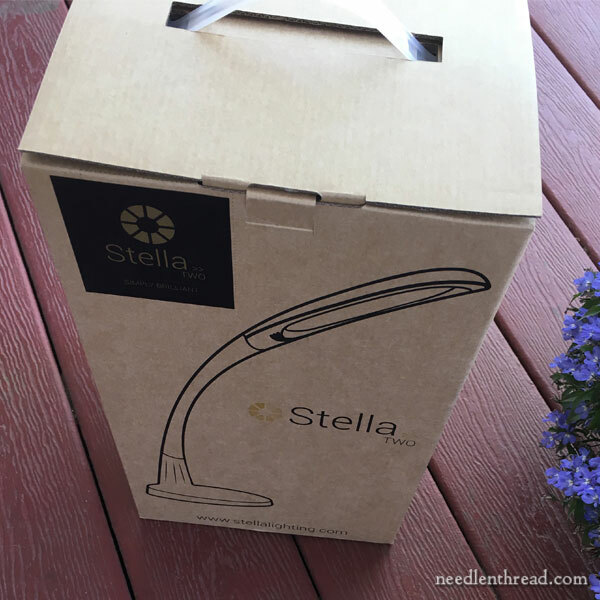 Thanks for reviewing the Stella 2 lighting for us and for the photos and the links to where to find it. Thanks Mary! If I had the extra $200+ I would totally get one of these. I always love your reviews. Hi Mary, I have magnifier lamps with light touch buttons for the tri-spectrum lighting too. As they are magnifier lamps, I let my students cover them up with a cloth after using. You can probably picture what happens when I return to my studio at night. I am greeted by spooky lights :). Sounds like a dream light. The Stella is on my wish list. Time to start saving my pennies. One day I would love to have one. I have went from incandescent to LED and love the difference. I even bought an LED for my 1948 Singer Featherweight and what a great difference. I wish I could find one for my Pfaff because it takes a halogen bulb and they get hot! What an incredible depth review. Sometimes you just need to pay the price for a great product. Wow, sorry to hear about that, Natalie – They do have a 2-year customer satisfaction guarantee, so they should replace it if it’s still within the two years from purchase. My sister’s has been running valiantly since 2013, practically daily. I’d try to contact them again (and again), until you get a response. If you drop me an email, I can give you the email address they used to write to me. Hopefully, that will get a quicker response. Contact Stella by phone if there is a problem with e-mail. Sometimes e-mail does awry (checking SPAM folders weekly is must for all of us). We’ve been carrying their lamps for a few years and they have always been great to deal with for warranty support. They even replaced the board on our floor model of the Sky for us as it gets a lot of abuse. While I do some communication via e-mail with them, for warranty issues for customers I always call them to give them a heads up. So just call and leave them a message and I know they’ll follow up. now I’m curious about how ones stitching area is setup? Do people stitch at a desk/table and have the task lamp on that? I tend to do long periods on the couch. Does anyone else do that? and do they have an end table? I’m excited to see this review, because I was trying to remember what my old sewing teacher had. I occasionally stitch on the couch, but normally, I stitch at a table. But when I do hanker for some good couch stitching, I set up a little temporary folding wooden table (they call them TV tables, I think?) and put my lamp and my stitching accessories on that, on the end of the couch that doesn’t already have a little decorative table and lamp. Thanks for the comprehensive review. I had a long conversation with Nathan from Stella a week ago and he gave me all the particulars of the version 2 lamp so I need to pick the new lamps up for the shop. Thanks for mentioning that we do carry them. I personally use the Edge so I’m waiting for the new technology to come to it as well. There wasn’t a timeline for that at the moment, but I’m hoping it will make it there in the not too distant future. I do a lot of over-one work in cross-stitch on 40 & 45 count linen as well as some counted work and embroidery on 45 and up count linens. 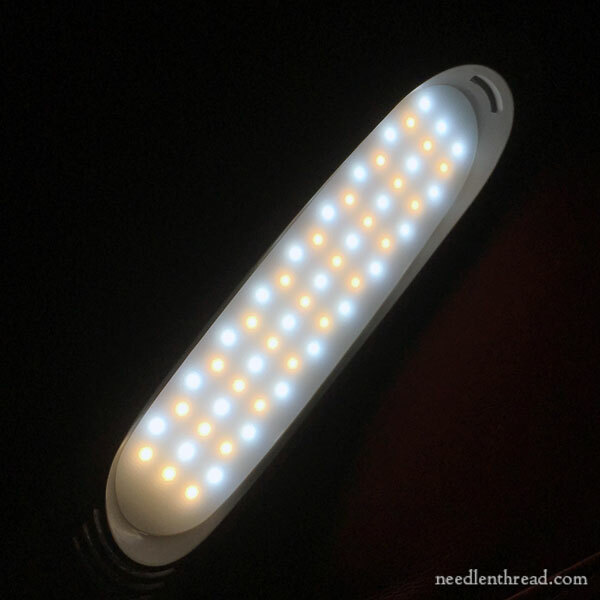 Lighting is such an important factor in our stitching! Next Next post: Stop Stitching! What’s Your Time Worth?